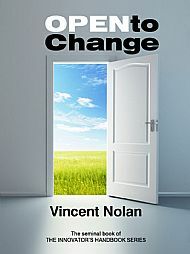 October 2015: Vincent's favourite production, 'Open to Change: The Innovator's Handbook' is now available as a free PDF download. Just click the pic below! Synectics has been at the heart of my working life since I encountered it in 1971. Synectics Inc. had been researching the innovation process and applying the findings to the needs of major businesses since 1960. It seemed to me that they had found the answers to the frustrations I had encountered in my career till then. 42 years on, I still feel the same way! I started the Synectics business in Britain in 1971, and retired from the company in 1994, after which I continued to practise commercially as an independent consultant and pursued an ambition to make the methods available to a wider public, through Synectics Education Initiative, a UK Charity. Most of the site is devoted to aspects of my work with Synectics, particularly the books I have written and edited. SEI’s latest project is to present aspects of Synectics in short video clips on YouTube, the first of which may be seen below.